Hence, according to Selye muscular activity is one of the most important stressors (abnormal stimuli that attack the body), and it is characterised by the fact that it produces a very brief period of shock, followed by very marked counter-shock phenomena. Stress causes in physical exercise are numerous and of course they mutually compound one another with a cumulative effect. The repetition of the physical stress (physical exercise or STIMULUS), produces a variable effect according to the nature of the intensity of the previous exposition to the physical stress in question, and to the duration of the rest between the two (ADAPTING PHASE). It is in this very phase that the adapting phenomena related to the specific nature of the stimulus emerge and grow more intense. If the first exposition is not too severe and the duration of the adapting phase (rest) is sufficiently long, when the second exposition occurs the body is ready for it and features from the outset a greater adapting capability, as the body always gives back in return more than has been expended with workout. This increase in energy availability is defined SUPERCOMPENSATION. This entails a subsequent increase in the resistance to a specific stimulus compared to the first time it occurred, provided that the time between the two expositions is not excessively long and that the body is therefore able to remember it. In this case, a subsequent, well dosed exposition (even if more intense than the previous one) will further increase the body's adapting and resisting capabilities. This sandwich-like succession of training "layers" will increase the body's resistance and prepare it for increasingly difficult tasks. Indeed, the body adjusts to this succession of stresses with precise and specific reactions that arise in the form of muscular hypertrophy, heart hypertrophy, etc. Conversely, if the expositions to physical stress are too intense, too long, or the resting periods are too short, the result is the opposite: the body's resistance is blocked at a lower level and acute fatigue (a breaking down phase) is more likely to occur, which corresponds to the overtraining syndrome. Organising the muscles' workout appropriately therefore entails a rational distribution of the STIMULUS-ADAPTING ratio, so that the SUPERCOMPENSATION effect can be enhanced to the greatest possible extent. 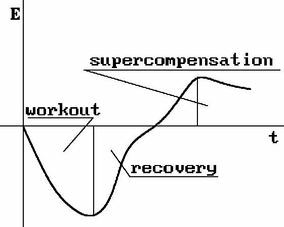 The occurrence of the stimulus (the load in the training session) that is aimed at developing this supercompensation must therefore be accurately studied; in general it must be introduced when the previous supercompensation can be deemed to be complete. Some functions feature rather brief supercompensation periods while others occur significantly over a period of several days. This phenomenon is described as HETEROCRONYSM of the functions. Knowledge of this phenomenon is essential in programming training activities, as the dynamics of the training loads is based on total or partial recovery periods for each function. Biological function Training type (t”) Supercomp. period Signific. improv. fhosphocreatine strength-speed approx. 30 min. c.- The enzymes of the Krebs cycle govern long-lasting low impact endurance type performances (lasting as long as several hours) that depend on the functioning of the aerobic energy process. d.- The metabolism of proteins is the basis of the muscular hypertrophy mechanism that can be explained as follows. The fundamental index of the activity of any living system is constituted by the enzymatic process of destruction and reconstruction of proteins. The synthesis of proteins requires a great amount of energy and this depends on the availability of ATP molecules storing energy in their phosphoric bonds. becomes impossible. Thus a competition occurs between the use the ATP's use of energy, on the one hand for functional activity, on the other to increase the muscle cell through the blood' oxygen exchange. As an intense activity, no matter how brief, requires more oxygen than is available, the re-synthesis of the consumed ATP occurs essentially with the aerobic phosphorylation, which is characterised by the fact that it is rather inefficient from the energy point of view. When the glycolysis is greater, first of all there is an increase in the destruction of proteins; secondly there is a decrease in the level of ATP in the muscles, owing to the inefficiency of the glycolysis. This creates particularly favourable conditions for the development of muscular hypertrophy.